Yet more Antarctic expedition stamps! These appear to relate to the 10th Soviet Antarctic Expedition. According to Wikipedia, the 10th Soviet expedition was led by M.E.Ostrekin and I.G.Petrov. 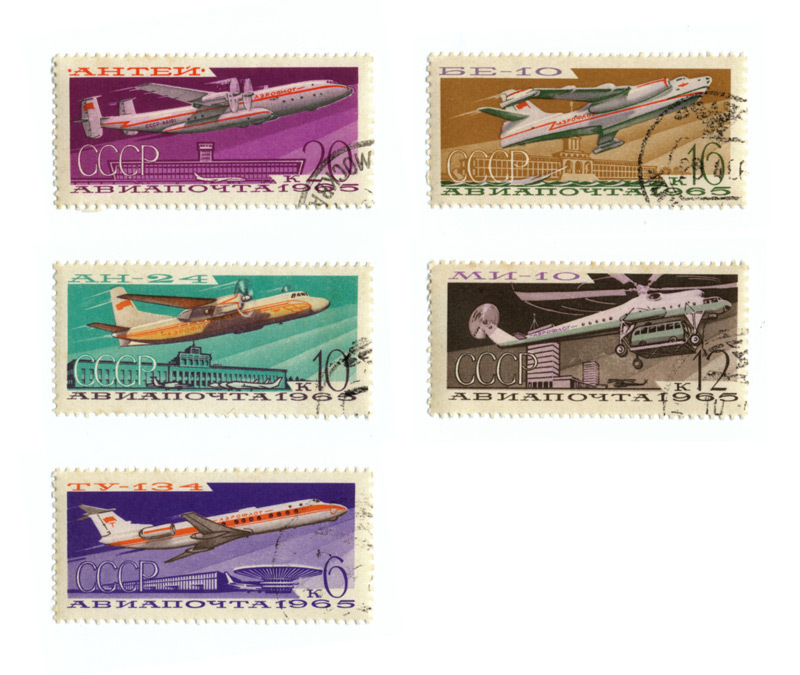 The various Soviet aircraft depicted in these stamps: Antonov An-22 (the world’s largest production aircraft until the advent of the C-5 Galaxy), Beriev Be-10 (jet-powered flying boat and patrol bomber), Antonov An-24, the Mil Mi-10 (a flying crane helicopter), and the Tupolev Tu-134. 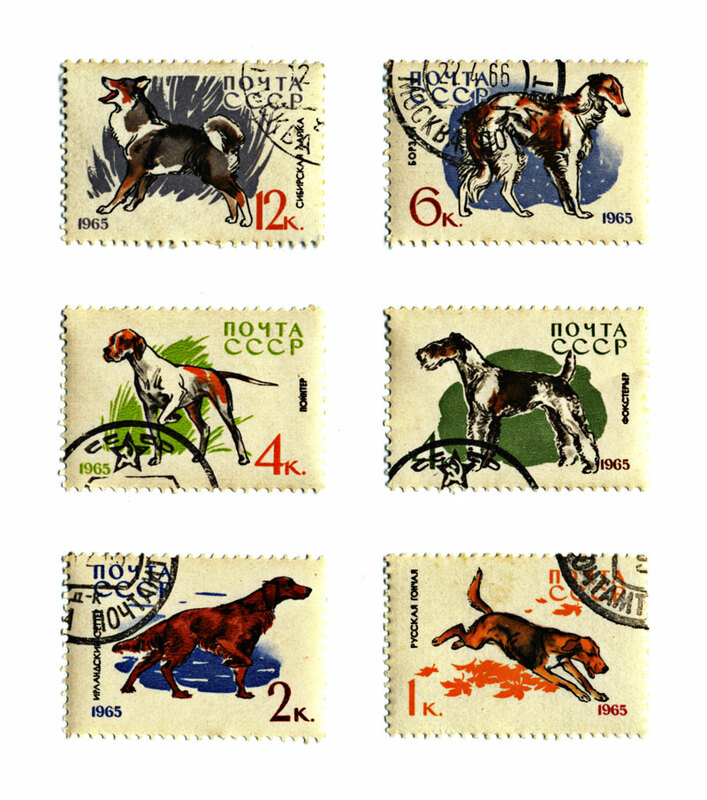 Various Soviet stamps depicting dogs from 1965. How many can you recognize? 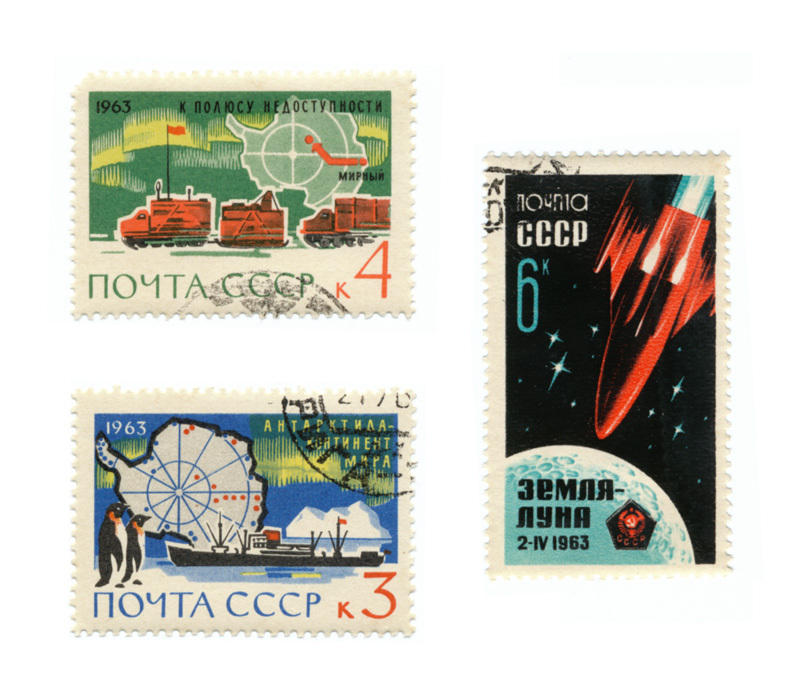 Between 1959 and 1976, the Soviet Union launched 24 robotic spacecraft toward the moon. These were the Luna missions. On February 3, 1966, Luna 9 became the first spacecraft to land successfully on the lunar surface and transmit photographs back to Earth. On March 13, 1966, Luna 10 became the first artificial satellite of the moon. On August 27, 1966, Luna 11 — essentially a backup of the Luna 10 spacecraft — became the second artificial satellite of the moon. The two latter missions included scientific instruments designed to study lunar chemical composition, gravitational anomalies, and radiation. Commanded by Pavel Belyayev and piloted by Alexei Leonov, Voskhod 2 was launched into orbit on March 18, 1965. Alexei Leonov became the first man to walk in space at 08:34.51 UTC — 90 minutes into the mission. This first, tentative spacewalk was reportedly plagued with problems. For example, due to over-pressurization of his spacesuit and a bad boarding procedure, Leonov briefly became stuck in the airlock and had difficulty re-entering the Voskhod 2 spacecraft. 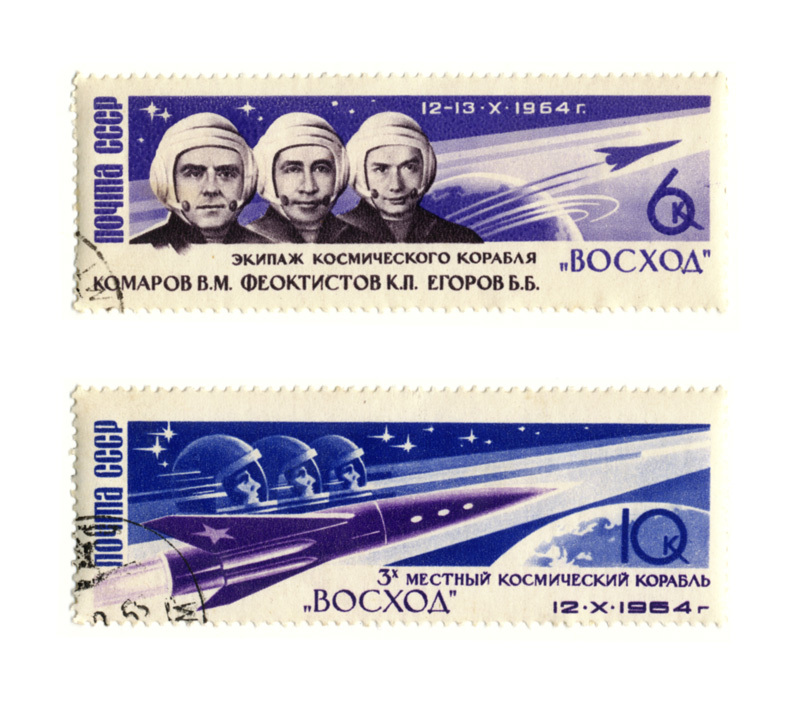 These stamps appear to depict the crew of the 1964 Voskhod 1 space flight: Vladimir Komarov, Konstantin Feoktistov, and Boris Yegorov. This was the first multi-person space flight. 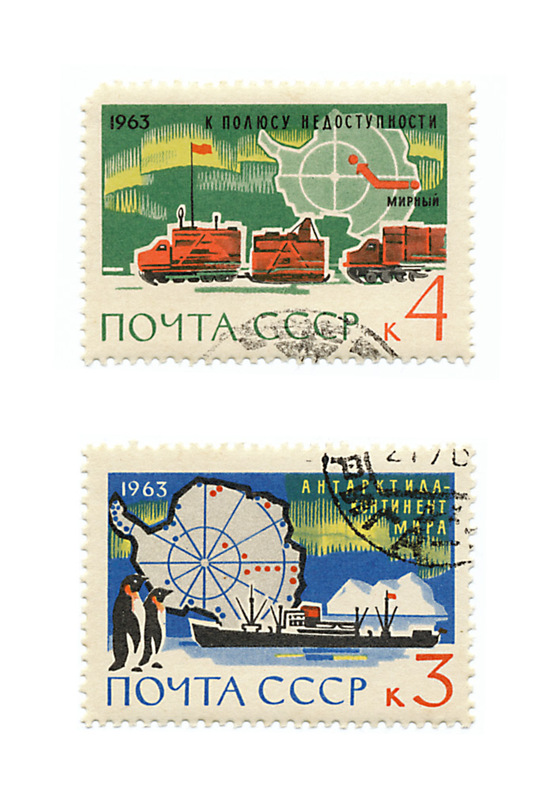 Notice the strong left-to-right diagonal composition in both of these stamps. In cultures which parse lines of text from left to right, a line angled such that the left is lower than the right is interpreted as rising and emotionally uplifting. This compositional approach is useful when an artist or designer wishes to intimate a positive future. When reversed — such that the left is higher than the right — this is useful to intimate a positive past. Vostok 5 — piloted by Valery Bykovsky — and Vostok 6 — piloted by Valentina Tereshkova — were, like Vostok 3 and Vostok 4, a joint manned space flight. Valentina Tereshkova was the first female cosmonaut. Vostok 3 — piloted by Andrian Nikolayev — and Vostok 4 — piloted by Pavel Popovich — were the first manned space missions to orbit the Earth simultaneously and share communication by radio. 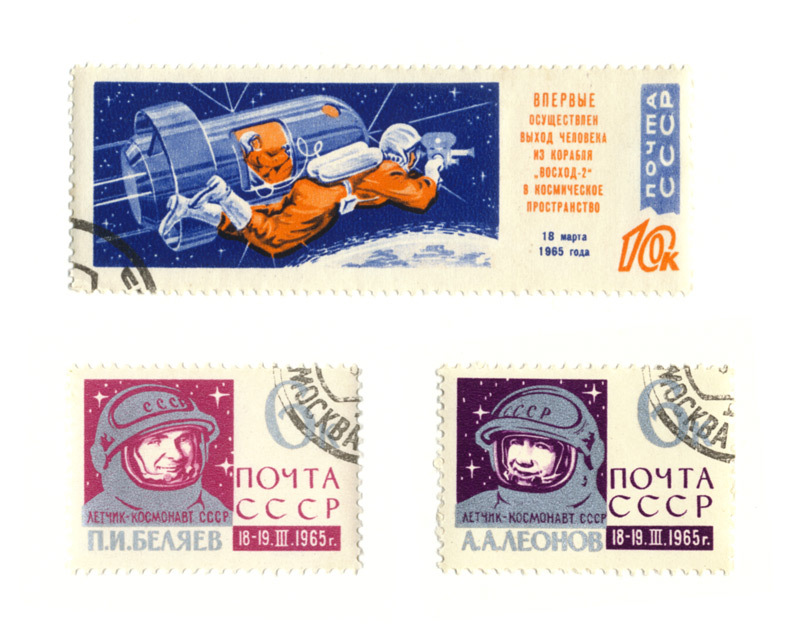 Here is a small group of vintage canceled CCCP stamps depicting several different space craft. 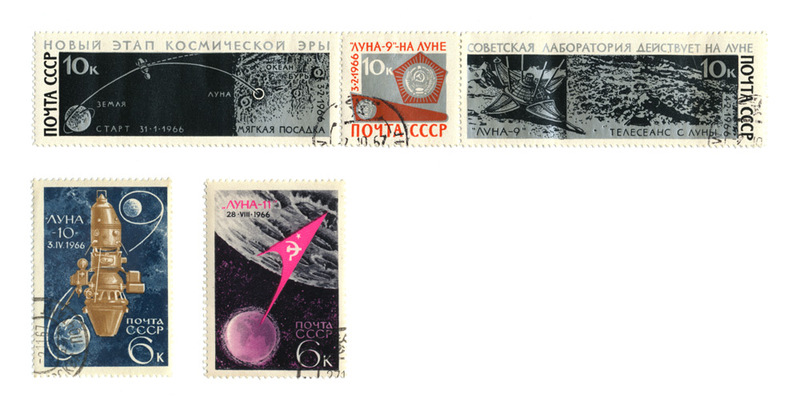 From left to right: Sputnik 1, Luna 3 — possibly — and Vostok, and maybe a Venera probe. 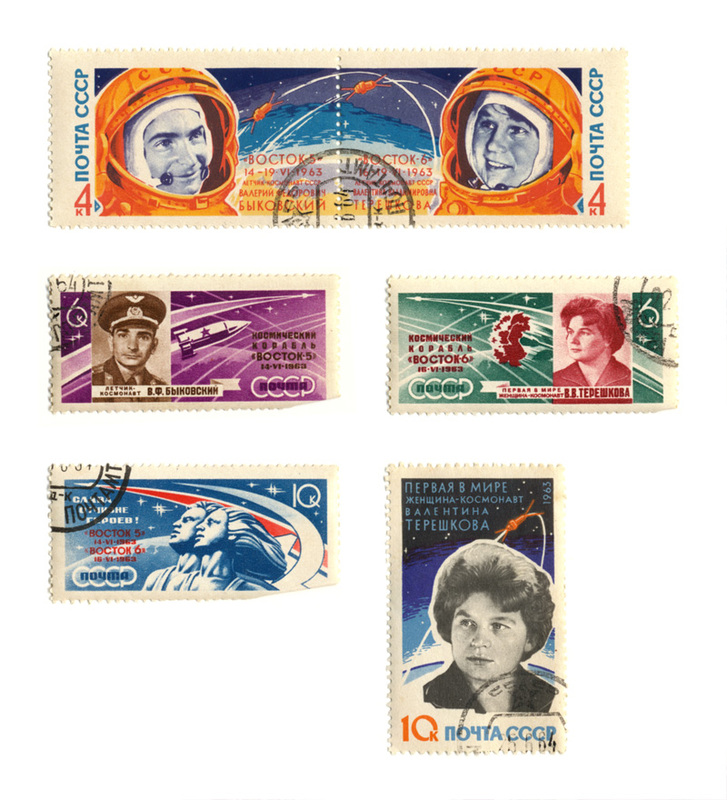 Canceled stamps which appear to depict the 9th Soviet Antarctic Expedition — led by Dr. Mikhail Somov — and a moon mission (possibly the Soviet Luna program; I wish I could read Russian). 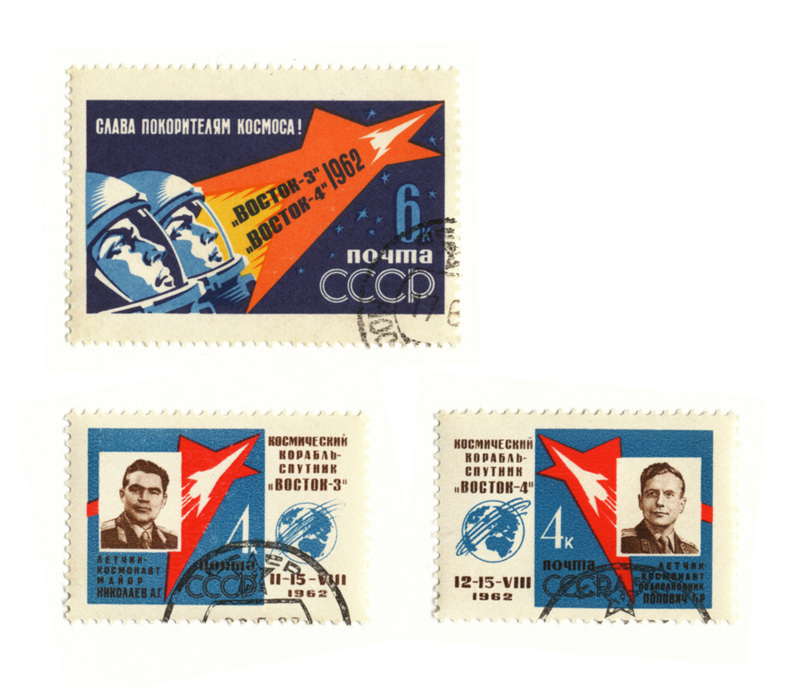 Something to note in these stamps — and the others posted throughout this week — are the similarities in graphic design. Generally, the negative space is employed to graphically depict a macroscopic aspect of the subject (ie, what the person or program was about) while the foreground is dedicated to microscopic visual aspects of the subject (ie, specific portraiture, wildlife, technology, etc). 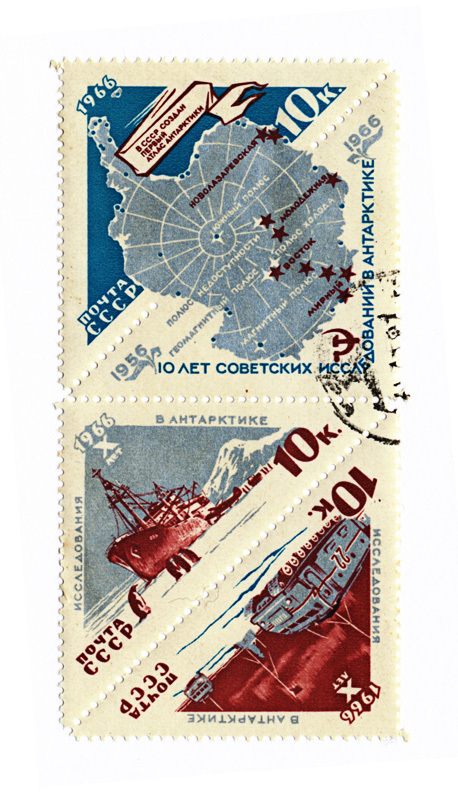 Update 2009-02-09: I’ve uploaded an enlargement of the Antarctic Expedition stamps. Update 2009-02-10: Many thanks to Saintneko and the artists of the Li’l Nyet web comic for furnishing a translation of these stamps in the comments below!